At 85 years old, you’d expect Madhur Jaffrey to be taking it easy, doing what she’s been doing best for the last 5 decades; acting, cooking and writing books about the latter. 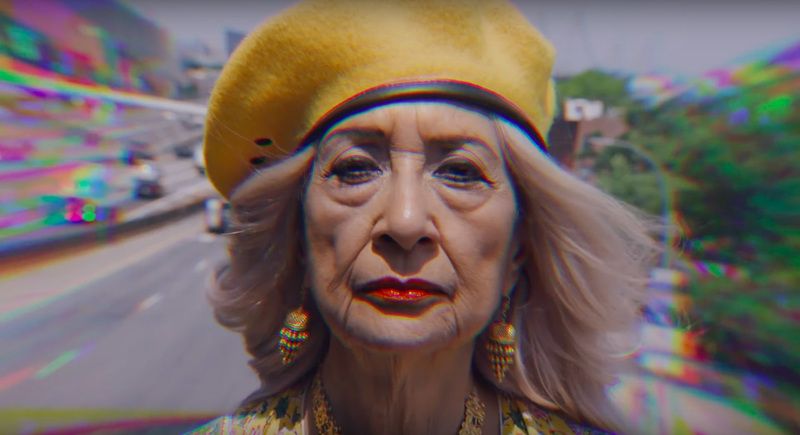 However, earlier this month, she surprised everyone by donning the hat (or a gangster beret) of a rapping grandmother in the music video for Mr. Cardamom’s Nani. The badass nani can be seen teaching her bullying kids a lesson in respect, recruiting South Asian children to run a crime syndicate and taking her rightful place as the matriarch of her family as she dances elegantly to the music’s heavy, hip-hop beats. What gave him the grand idea to cast Jaffrey as the feisty protagonist? “In 2018, while I was thinking of making this video, a friend of mine of mine suggested that it’d be “amazing to cast Madhur Jaffrey in it,” and I agreed, but had no idea of how to reach out to her. I knew that my mom — filmmaker Mira Nair — knew her, but I didn’t want to take that route. A common friend passed on my email to Jaffrey, and she was somehow interested.” Jaffrey was very receptive to the idea, as Mamdani describes, “She had no qualms about any of the swearing and never asked to tone it down a certain way to keep it respectable.” Mamdani shot the music video in May of the same year. The music video is also representative of the South Asian-American diaspora. Mamdani comments, “I wish I could say that it was very intentional but it was quite a coincidence.” His friends — who pitched in — happen to be all different desis. “The beauty of being a minority is that you’re so few, that you don’t get to focus on many of the differences between yourselves, which in another setting might seem consequential.” He said that some of the crew and cast members had no idea who Jaffrey was and were surprised when they found out. What did you think of Zohran’s idea? I wanted to do it, even though I didn’t know too much about it. I knew that it was like acting, only that there was singing and rapping involved. That’s what scared me the most. As a whole, I had to concentrate more on the words and their rhythm. I was trying to get that right because after all, Zohran is a rapper and I didn’t want to let him down in anyway. How did you prepare to lip-synch to the rap? It was very difficult to learn the lines and to say them at that speed. It was for me, the hardest part. I was given the words first to understand them, but these weren’t words I use regularly, so it became a question of understanding the character’s spirit and what emotions Zohran was trying to express. Obviously, nani’s had a hard time, but she’s come through it. What was it like playing Nani’s role with such sass? Zohran and I talked about the character’s various aspects; what she’d wear, what she’d look like etc…and I had envisioned this Kali-like figure at one point, especially because of the makeup. Zohran, obviously adores his nani and I thought if I was to play her, I had to play her like a slightly goddess-like, empowered woman, and it turned out to be interesting. It was all done rather quickly. I had sketched a couple of ideas in my head, like the ones mentioned above, and made up a character which displayed all that. It was also like playing Lady Macbeth. One reads it repeatedly and decides what the character is. What was the experience of shooting the music video? It was absolutely wonderful. Zohran’s a very clever and gentle person. He helped me work the angles for the camera right and let me find the character; I love it when the director can trust the actor and gives the liberty to go, explode and just do it. I flourish under such circumstances. He knew I needed help with the rapping, so we practiced it repeatedly, till we both were comfortable that I was rapping right. He had patience, which not many people do. His behaviour brought out the best in me. At the beginning of the video, nani is scolded, but she takes matters into her own hands. What does it say about empowering the older generation and treating them with respect? It’s not just about empowering the older generation, but also women. She was being treated very badly, being bullied and told that her job was to look after her grandkids. She’d had enough, didn’t want to do it that way anymore and rebelled. We all have the need to be ourselves and not be pushed around. It’s an empowering character that Zohran wrote. What were the reactions you received? They were unbelievable. We didn’t expect any of it. It came as a huge surprise. People were enjoying it. My friends thought it was fantastic, and that I was having a great, fun time. It makes you laugh. What was something special you took away from this entire experience? That it was such a different kind of art, that I hadn’t done before. Even the rapping. I love challenges and Zohran was the perfect person to take this up with.